Monday to Friday from 08:30 to 16:30. Closed between 12:45 and 14:00. Contact tickets@fsrugby.co.za or 05 1 4071701 / 051 407 1725. Tickets are available from the Ticket Office in Toyota Stadium (Gate 8) or online. Online tickets can be printed at home or linked to the ticketing application (Cheetah App.) Tickets purchased from any other website will not be valid. Tickets can be transferred to a cell phone, to be scanned at turnstile. Tickets can be shared to other devices containing the Cheetah App. Download the Cheetah App on Play Store or iStore, click here to download. Each ticket has a unique barcode that will allow access to one spectator only. Secure your ticket. Duplicated or damaged barcodes are invalid. Toyota Stadium is wheelchair friendly with special designated parking bays and seating for people with disabilities. Entrance and access at Gates 8, 7, 6 and 5. Special seats for persons with disabilities are allocated in Blocks T1, T2, T10, T11 on upper level of the Twizza Main Stand and also Blocks B20, B22 (alcohol free area) lower level open stand. Special toilet facilities are in close vicinity of disabled seating. Ticket for a helper is free. An online ticket has to be printed twice. The helper’s ticket will be scanned at the turnstile, while the person in the wheelchair will get access through the gate, next to the turnstile. Safe, under roof parking available in Loch Logan Waterfront next to the stadium. Parking fees applicable. Free Parking for all Toyota drivers in the Toyota VIP Parking inside Toyota Stadium. Entrance off Att Horak Avenue. *Terms and Conditions apply / Parking on a first come first serve basis. Parking available at the open area next to the Tourism Centre (on the corner of Betogers and Att Horak). Bring your braaier to this area and warm up for a great day of rugby! Public parking spaces to be utilised by busses. No dedicated bus parking available inside stadium grounds. Certain hotels and guest houses offer shuttle service for guests. Smoking is prohibited in the stands. Dedicated smoking areas are available in the walkways behind the stands. Smoking in Toyota Stadium is regulated by applicable law. For the convenience and safety of supporters, a unique cashless system is available in Toyota Stadium, Bloemfontein. This trend setting technology allows supporters to upload money on a ticket, season ticket, card or barcode to make in-stadium purchases at Castle Deck on match day. The Ticket Office and a dedicated point at Gate 6 (Walkover Bridge) will assist to upload money onto a ticket, season ticket, card or barcode on match days. Barcodes can be attached to supporter’s replica jerseys which will function as your entrance ticket. Feel the excitement building when the legendary Harley Davidsons welcomes the teams onto the field. Supporters have become costumed to the live performances by popular artists at the Castle Deck Stage, usually after the main match. Unless announced otherwise, supporters are allowed and welcome to go onto the field after the main match. Toyota Cheetah players often meet fans and hand out signatures or offer to take selfies with fans on the field after the match. Usually Toyota Cheetah players visit the stage at the Castle Deck after home games to engage with supporters. Sparta braai facilities available next to Castle Deck. Food and beverages at concession stand inside the stadium. Alcoholic beverages at available at various bar facilities. Free State Rugby caters for fun loving young adults with an upmarket entertainment area on the Twizza Main Stand upper level deck area with music presented popular DJ’s. 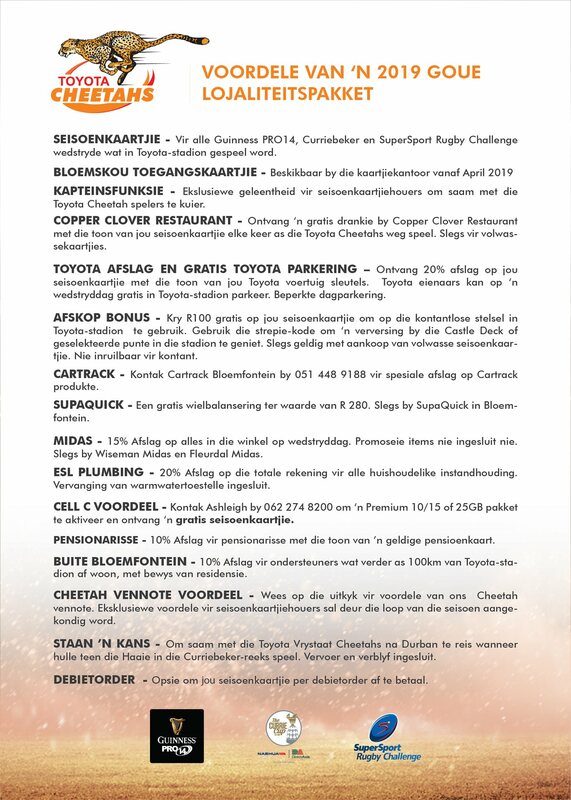 Nothing is more important than supporters and Free State Rugby believes that the Toyota Cheetahs belongs to the people of the Free State. 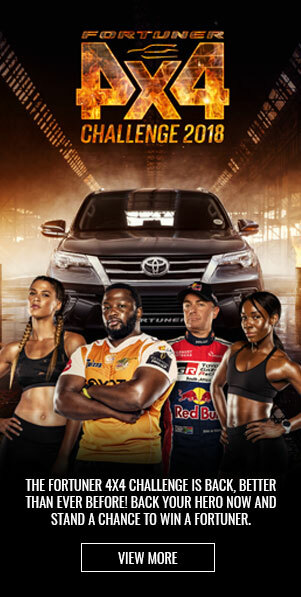 The Toyota Cheetahs continuously encourage the community of Mangaung and the Free State to attend rugby games and enjoy a fun experience. In the case of an emergency on match day, the VOC (Venue Operation Centre) can be contacted at 051 407 1743 to provide in stadium assistance. For a medical emergency on match day the MEDICAL VOC (Venue Operation Centre) can be contacted at 051 407 1771 for in stadium medical assistance. ER24 provides medical assistance on a match day and VR Security is responsible for security in the stadium. Please click on the Terms & Conditions to see the list of prohibited items at the Stadium. For your safety, every person entering Toyota Stadium are subjected to a security check. Weapons or objects which can compromise public safety, liquor or drugs, raw meat, cameras (still or video), animals, fireworks, no excessive noise, megaphones, hooters or gas-powered horns, vuvuzelas not allowed. Toyota discount & Free Toyota Parking - present your Toyota keys and qualify for a 20% discount on your season ticket as well as free Toyota parking. First come, first serve. Start-up bonus of R100 on the Toyota Stadium Cashless system. The start-up bonus of R100 is non-redeemable. Load cash onto your season ticket bar code, swipe or scan at selected bars in Toyota Stadium for cashless transactions. Only applicable to paid adult season tickets. Cartrack - for special discount on Cartrack products contact Cartrack Bloemfontein at 051 448 9188. SupaQuick - one free wheel alignment to the value of R280. Exclusive to Supa Quick in Bloemfontein. Midas - 15% Discount on everything in store on game day (excluding promotional items). Exclusive to Wiseman Midas & Fleurdal Midas in Bloemfontein. ESL Plumbing - 20% Discount on total invoice for all household maintenance including geyser replacements. Cell C special – Call Ashley at 062 274 8200 to activate a premium 10/15 or 25GB package to receive a FREE Cheetahs season ticket. 10% discount for pensioners with pensioners card. 10% discount for supporters living 100 km or more from Toyota Stadium – proof of residence required. Discount can not be accumulated. Maximum % discount applicable. Family Package includes 2 adults and 2 scholar or student tickets. Scholar -between 7 – 17 years.Adult – 18 years and older. Free entry for kids younger than 7 years. Contact the ticket office at the 051 407 1701/25 or email tickets@fsrugby.co.za or phone Anri at 051 407 1783. 1. The Accreditation Pass is issued subject to the Rules and Regulations of Free State Rugby Union and Free State Cheetahs Company (Pty) Ltd as set-out at www.fscheetahs.co.za. 2. The right of Accreditation granted to the Accredited Party is subject to the full Accreditation Terms and Conditions (the “Accreditation T&C”). 3. Every Accredited Party is deemed to have read and agreed to the provisions of these General Terms and Conditions of The Stadium. 4. The Accreditation Pass will remain the property of the Free State Rugby Union (FSRU) and Free State Cheetahs Company (Pty) Ltd (Cheetahs Company) until the end of the rugby season in the year when the ticket was issued. 5. This Accreditation Pass and the rights attached to it are personal to the party named hereon (the “Accredited Party”) and non-transferable and must be clearly displayed (on the chest / lanyard around neck) at all times. 6. This Accreditation Pass only allows access for ONE person and every person will receive a unique barcode registered to his / her name. 7. The bearer may enter only those areas or facilities as designated by the FSRU and the Cheetahs Company and as displayed hereon. 8. The Accreditation Pass does not give the Accredited Party or anyone else the right to obtain a seat. 9. The Accredited Party acknowledges that this Accreditation Pass, and the right of Accreditation which comes with it, may be removed and/or the Accredited Party may be refused access to any Permitted Area for any breach of the Accreditation T&C or otherwise in accordance with the Accreditation T&C. 10. The FSRU and Cheetahs Company may conduct security searches to personal belongings and/or outer clothing on entry, exit or at any time to ensure the safety of the venue and guests/supporters. 11. FSRU and Cheetahs Company may refuse admission to, or eject from The Stadium and Venues any person who refuses to be searched. 12. Any person who fails to comply with instructions from a steward, security officer, official or personnel or any other person acting on behalf of the FSRU and Cheetahs Company may be ejected from The Stadium and Venues. 13. By using the Accreditation Pass to enter any Permitted Area, the Accredited Party declares that he/she has read and understood the Accreditation T&C and General Terms and Conditions and agrees to be bound by and to comply with them in full. 14.3 specifically where the Accredited Party is a member of the press or a photographer, the provisions relating to commercial use of still photography images. 15. The Accredited Party hereby indemnifies and holds the FSRU and Cheetahs Company harmless from and against all damages and liabilities suffered or incurred in connection with, resulting from or arising out of any breach of the Accreditation T&C. 16. Admission to The Stadium and Venues is at the Accredited Party's own risk. 17. Neither FSRU nor Cheetahs Company, or any person/company acting on behalf of the FSRU and Cheetahs Company, shall be liable for any loss or damage sustained within the premises or personal injury or accident to the Accredited Party. 18. Accreditation cards may not be handed to another person either over or under the turnstiles without swiping the barcode. Accreditation cards may not be exchanged through the fence or via any action where one person has already entered The Stadium, and the receiver of the ticket/-s is still outside The Stadium. Only the card holder may swipe his/her accreditation at the turnstiles, except when ticketing officials provide assistance. 19. Accreditation cards will not be issued to any person younger than sixteen (16) years. 20. South African Immigration law determines that foreigners need to have a work permit. In cases where foreigners are applying for an accreditation card, he/she must attach all the necessary documentation to the application to support the work permit. 22. Please be advised that FSRU and Cheetahs Company Terms and Conditions also refer to The Safety at Sports and Recreational Events Act, 2010 (Act No 2. of 2010) to ensure full compliance to the Act. 23. Refer to www.fscheetahs.co.za for full terms and conditions. 1. This Accreditation Pass is only valid according to the date / opposing team logo displayed on the front cover of this ticket and for one day only. 2. The Accreditation Pass is not a valid stand ticket and only allows access to a person/company that contributes to the Event as a Service Provider. 3. The Accreditation Pass is issued subject to the Rules and Regulations of Free State Rugby Union and Free State Cheetahs Company (Pty) Ltd as set-out at www.fscheetahs.co.za. 4. The right of Accreditation granted to the Accredited Party is subject to the full Accreditation Terms and Conditions (the “Accreditation T&C”). 5. Every Accredited Party is deemed to have read and agreed to the provisions of these General Terms and Conditions of The Stadium. 6. The Accreditation Pass will remain the property of the Free State Rugby Union (FSRU) and Free State Cheetahs Company (Pty) Ltd (Cheetahs Company) for the duration of the specific event. 7. This Accreditation Pass and the rights attached to it are personal to the party that registered at FSRU and Cheetahs Company offices / online and are non-transferable to parties that are not service providers to the Registered Party. 8. This Accreditation Pass only allows access for ONE person and every person will receive a unique barcode registered to his / her name. 9. Accreditation Passes must be clearly displayed on once chest / lanyard around neck; if not, access can be refused to The Stadium or specific area inside The Stadium. 10. The bearer may enter only those areas or facilities as designated by the FSRU and the Cheetahs Company and as displayed hereon. 11. The Accreditation Pass does not give the Accredited Party or anyone else the right to obtain a seat. 12. The Accredited Party acknowledges that this Accreditation Pass, and the right of Accreditation which comes with it, may be removed and/or the Accredited Party may be refused access to any Permitted Area for any breach of the Accreditation T&C or otherwise in accordance with the Accreditation T&C. 13. The FSRU and Cheetahs Company may conduct security searches to personal belongings and/or outer clothing on entry, exit or at any time to ensure the safety of the venue and guests/supporters. 14. FSRU and Cheetahs Company may refuse admission to, or eject from The Stadium and Venues any person who refuses to be searched. 15. Any person who fails to comply with instructions from a steward, security officer, official or personnel or any other person acting on behalf of the FSRU and Cheetahs Company may be ejected from The Stadium and Venues. 16. By using the Accreditation Pass to enter any Permitted Area, the Accredited Party declares that he/she has read and understood the Accreditation T&C and General Terms and Conditions and agrees to be bound by and to comply with them in full. 17.3 specifically where the Accredited Party is a member of the press or a photographer, the provisions relating to commercial use of still photography images. 18. The Accredited Party hereby indemnifies and holds the FSRU and Cheetahs Company harmless from and against all damages and liabilities suffered or incurred in connection with, resulting from or arising out of any breach of the Accreditation T&C. 19. Admission to The Stadium and Venues is at the Accredited Party's own risk. 20. Neither FSRU nor Cheetahs Company, or any person/company acting on behalf of the FSRU and Cheetahs Company, shall be liable for any loss or damage sustained within the premises or personal injury or accident to the Accredited Party. 21. Accreditation cards may not be handed to another person either over or under the turnstiles without swiping the barcode. Accreditation cards may not be exchanged through the fence or via any action where one person has already entered The Stadium, and the receiver of the ticket/-s is still outside The Stadium. Only the card holder may swipe his/her accreditation at the turnstiles, except when ticketing officials provide assistance. 22. Accreditation cards will not be issued to any person younger than sixteen (16) years. 23. South African Immigration law determines that foreigners need to have a work permit. In cases where foreigners are applying for an accreditation card, he/she must attach all the necessary documentation to the application to support the work permit. 25. Please be advised that FSRU and Cheetahs Company Terms and Conditions also refer to The Safety at Sports and Recreational Events Act, 2010 (Act No 2. of 2010) to ensure full compliance to the Act. 26. Refer to www.fscheetahs.co.za for full terms and conditions. 1. Suite/Stand tickets are valid for all events hosted at The Stadium under the jurisdiction of the Free State Rugby Union (FSRU) and Cheetahs Company Pty Ltd (Cheetahs Company). The ticket is valid for the event printed on the front side of this ticket. 2. Tickets must be produced at the entrance points and on request of any official, steward, security officer or personnel from the FSRU and Cheetahs Company or Event Organizer. 3. Admission to The Stadium is granted at ticket holders own risk and subject to a search. 4. The bearer of a suite/stand ticket confirms, that by entering The Stadium premises, he/she will be considered to have acquainted themselves with the indemnity displayed on the Important Notice erected on the outside of The Stadium and fully understands the contents thereof. 5. All seats at The Stadium are reserved and ticket holders must sit accordingly to the seat or stand numbers. 6. Should matches for any reason beyond the control of the FSRU and Cheetahs Company not take place, no refunds will be made in respect to this ticket. 7. Tickets are not replaceable due to loss, theft, damage or for any other reason whatsoever. 8.1 Please note that cellphone cameras will be allowed into the stadium, but unfortunately due to the nature of the business no other type of camera will be allowed in The Stadium. 8.2 Please note that due to sponsorships, raw meat may not be brought into The Stadium. 9. Officials, stewards, security officers or personnel from the FSRU and Cheetahs Company MAY NOT keep/store forbidden items in The Stadium for safe-keeping during the duration of the event. It is the owners’ own responsibility to secure items outside of The Stadium premises. 10. Smoking is prohibited on the stands and in suites. 11. No liquor may be consumed on the main stand and alcohol free areas on the Eastern Stand, with exception to the private suites in these areas. 12. Tickets cannot be refunded, cancelled, returned or exchanged. 13. Parking can be purchased additionally and is subject to availability. 14. FSRU and Cheetahs Company reserve the right to substitute the allocated seat of the holder with another if necessary, without prior notice to the ticket holder. 15. Failure to comply with the terms and conditions of FSRU and Cheetahs Company may resolve in access refusal or possible arrest. 16. Child and student tickets with a face value of R10.00 (ten rand) or less do not qualify for an additional discount. 17. Ticket Office: 051 407 1701 or 051 407 1725. 19. The ticket holder hereby indemnifies and holds the FSRU and Cheetahs Company harmless from and against all damages and liabilities suffered or incurred in connection with, resulting from or arising out of any breach of the T&C. 20. Admission to The Stadium and Venues is at the ticket holders’ own risk. 21. Neither FSRU nor Cheetahs Company, or any person/company acting on behalf of the FSRU and Cheetahs Company, shall be liable for any loss or damage sustained within the premises or personal injury or accident to the ticket holder. 22. Ticket resale or ticket touting is not allowed. FSRU is the only licensed ticket seller and are the only controlling body to sell Event Tickets either at the FSRU Ticket Office or through the official website. 23. Game Day tickets may not be handed to another person either over or under the turnstiles without swiping the barcode. Game Day tickets may not be exchanged through the fence or via any action where one person has already entered The Stadium, and the receiver of the ticket/-s is still outside The Stadium. Only the card holder may swipe his/her ticket/-s at the turnstiles, except when ticketing officials provide assistance. 24. Please be advised that FSRU and Cheetahs Company Terms and Conditions also refer to The Safety at Sports and Recreational Events Act, 2010 (Act No 2. of 2010) to ensure full compliance to the Act. 25. Refer to www.fscheetahs.co.za for full terms and conditions. 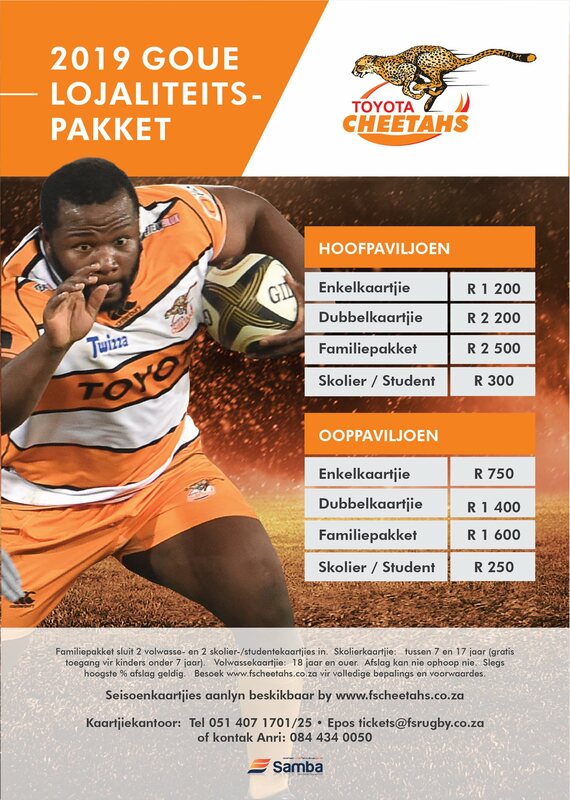 Make sure that you buy your online rugby tickets only through the Toyota Stadium ticket office or online via our official ticket mobile app https://fsrugby.appwizard.co.za/index2.htm or the official Cheetah website www.fscheetahs.co.za. No entry will be permitted to any person presenting false Match tickets. Fans are cautioned against purchasing tickets through unauthorized online re-sellers many of these tickets are fraudulent and will not be accepted. 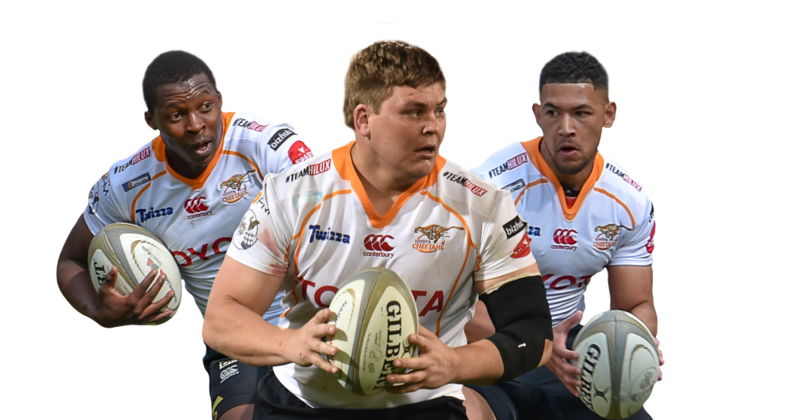 The Free State Cheetahs (Pty) Ltd cannot be held responsible for consequences that arise from the purchase of unauthorized tickets. 1. Suite tickets are valid for all events hosted at The Stadium under the jurisdiction of the Free State Rugby Union (FSRU) and Cheetahs Company Pty Ltd (Cheetahs Company). The ticket is valid for the event printed on the front side of this ticket. 2. International tests are NOT included and ticket holders will be notified on the entrance tickets. 3. Suite tickets must be produced at the entrance points and on request of any official, steward, security officer or personnel from the FSRU and Cheetahs Company. 4. Admission to The Stadium is granted at ticket holders own risk and subject to a search. 5. The bearer of a suite ticket confirms, that by entering The Stadium premises, he/she will be considered to have acquainted themselves with the indemnity displayed on the Important Notice erected on the outside of The Stadium and fully understands the contents thereof. 6. Should matches for any reason beyond the control of the FSRU and Cheetahs Company not take place no refunds will be made in respect to this ticket. 7. Tickets are not replaceable due to lost, theft, damage, or for any other reason whatsoever. 11. No liquor may be consumed on the main stand and alcohol free areas on the Eastern Stand, with exception to private suites in these areas. 18. The ticket holder hereby indemnifies and holds the FSRU and Cheetahs Company harmless from and against all damages and liabilities suffered or incurred in connection with, resulting from or arising out of any breach of the T&C. 19. Admission to The Stadium and Venues is at the ticket holders’ own risk. 20. Neither FSRU nor Cheetahs Company, or any person/company acting on behalf of the FSRU and Cheetahs Company, shall be liable for any loss or damage sustained within the premises or personal injury or accident to the ticket holder. 21. Ticket resale or ticket touting is not allowed. FSRU is the only licensed ticket seller and are the only controlling body to sell Event Tickets either at the FSRU Ticket Office or through the official website. 22. Suite tickets may not be handed to another person either over or under the turnstiles without swiping the barcode. Suite tickets may not be exchanged through the fence or via any action where one person has already entered The Stadium, and the receiver of the ticket/-s is still outside The Stadium. Only the card holder may swipe his/her ticket/-s at the turnstiles, except when ticketing officials provide assistance. 23. Please be advised that FSRU and Cheetahs Company Terms and Conditions also refer to The Safety at Sports and Recreational Events Act, 2010 (Act No 2. of 2010) to ensure full compliance to the Act. 24. Refer to www.fscheetahs.co.za for full terms and conditions. 1. This ticket is only valid for a vehicle and not for any passengers. 2. This parking ticket is only valid according to the date / opposing team logo displayed on the front cover of this ticket and is not transferable after entrance to The Stadium. 3. Drop-off tickets must be produced at the entrance points and on request of any traffic officer, official, steward, security officer or personnel from the FSRU and Cheetahs Company. 4. FSRU and Cheetahs Company in no way guarantee the security of any vehicle or its contents whilst on Stadium Premises. 5. Any vehicle parked in a position which is inconsiderate to the FSRU and Cheetahs Company or to the other car park users, may immediately and, notwithstanding the display or otherwise of a valid parking permit, be removed. 6. Vehicles in possession of a drop-off ticket must park in the designated areas clearly marked “drop-off area”, if not, the driver of the vehicle hereby accepts that the vehicle will be towed away on the owner’s / driver’s costs. 7. Vehicles may only park in these areas to make deliveries to private suites and may not be parked for more than 30 minutes. 8. Admission to The Stadium is granted at ticket holders own risk and subject to a search on the vehicle and the passengers - search may include an inspection of food by the Health Department. 9. All passengers entering the Stadium Premises have to submit a valid entrance ticket to the official. Access will be denied to any person in the vehicle without a valid entrance ticket or access pass. 10. The bearer of a drop-off ticket confirms, that by entering The Stadium premises, he/she will be considered to have acquainted himself/herself with the indemnity displayed on the Important Notice erected on the outside of The Stadium and fully understands the contents thereof. 11.1 Please note that cellphone cameras will be allowed into the stadium, but unfortunately due to the nature of the business no other type of camera will be allowed in The Stadium. 11.2 Please note that due to sponsorships, raw meat may not be brought into The Stadium. 11.3 Please note that The Stadium also does not allow a drop-off vehicle to have alcoholic beverages in the vehicle when entering The Stadium. 12. Officials, stewards, security officers or personnel from the FSRU and Cheetahs Company MAY NOT keep/store forbidden items in The Stadium for safe-keeping during the duration of the event. It is the owners’ own responsibility to secure items outside of The Stadium premises. 13. Failure to comply with the terms and conditions of FSRU and Cheetahs Company may resolve in access refusal or possible arrest. 14. Please be advised that FSRU and Cheetahs Company reserve the right to withdraw parking from any original advertised package/season ticket holder to comply to The Safety at Sports and Recreational Events Act, 2010 (Act No 2. of 2010). 15. The ticket holder hereby indemnifies and holds the FSRU and Cheetahs Company harmless from and against all damages and liabilities suffered or incurred in connection with, resulting from or arising out of any breach of the T&C. 16. Admission to The Stadium and Venues is at the ticket holders’ own risk. 17. Neither FSRU nor Cheetahs Company, or any person/company acting on behalf of the FSRU and Cheetahs Company, shall be liable for any loss or damage sustained within the premises or personal injury or accident to the ticket holder. 18. Drop off tickets may not be handed to another person either over or under the turnstiles without swiping the barcode. Drop off tickets may not be exchanged through the fence or via any action where one person has already entered The Stadium, and the receiver of the ticket/-s is still outside The Stadium. Only the card holder may swipe his/her ticket/-s at the turnstiles, except when ticketing officials provide assistance. 19. FSRU and Cheetahs Company Terms and Conditions also refer to The Safety at Sports and Recreational Events Act, 2010 (Act No 2. of 2010) to ensure full compliance to the Act. 20. Refer to www.fscheetahs.co.za for full terms and conditions. 1. This parking ticket is only valid according to the date / opposing team logo displayed on the front cover of this ticket and is not transferable after entrance to The Stadium. 2. Parking tickets must be produced at the entrance points and on request of any traffic officer, official, steward, security officer or personnel from the FSRU and Cheetahs Company. 3. FSRU and Cheetahs Company in no way guarantee the security of any vehicle or its contents whilst on Stadium Premises. 4. Any vehicle parked in a position which is inconsiderate to the FSRU and Cheetahs Company or to the other car park users, may immediately and, notwithstanding the display or otherwise of a valid parking permit, be removed at the costs of the owner or driver. 5. Admission to The Stadium is granted at ticket holders own risk and subject to a search on the vehicle and the passengers. 6. All passengers entering the Stadium Premises have to submit a valid entrance ticket to the official. Access will be denied to any person in the vehicle without a valid entrance ticket. 7. The bearer of a parking ticket confirms, that by entering The Stadium premises, he/she will be considered to have acquainted himself/herself with the indemnity displayed on the Important Notice erected on the outside of The Stadium and fully understands the contents thereof. 8. Parking at The Stadium are reserved and ticket holders must park accordingly to the designated area. 9. Should matches for any reason beyond the control of the FSRU and Cheetahs Company not take place no refunds will be made in respect to this ticket. 10. Tickets are not replaceable due to loss, theft, damage, or for any other reason whatsoever. 11.3 Please note that The Stadium also does not allow a vehicle to have alcoholic beverages in the vehicle when entering The Stadium. 13. Tickets cannot be refunded, cancelled, returned or exchanged. 14. Parking can be purchased additionally and is subject to availability. 15. Free State Rugby Union reserves the right to substitute the allocated parking of the holder with another if necessary, without prior notice to the ticket holder. 16. Failure to comply with the terms and conditions of FSRU and Cheetahs Company may resolve in access refusal or possible arrest. 21. Parking tickets may not be handed to another person either over or under the turnstiles without swiping the barcode. Parking tickets may not be exchanged through the fence or via any action where one person has already entered The Stadium, and the receiver of the ticket/-s is still outside The Stadium. Only the card holder may swipe his/her ticket/-s at the turnstiles, except when ticketing officials provide assistance. 22. FSRU and Cheetahs Company Terms and Conditions also refer to The Safety at Sports and Recreational Events Act, 2010 (Act No 2. of 2010) to ensure full compliance to the Act. 1. Parking tickets are valid for all events hosted at The Stadium under the jurisdiction of the Free State Rugby Union (FSRU) and Cheetahs Company Pty Ltd (Cheetahs Company). The ticket is valid for the year in which the ticket is issued. 2. Valid season ticket holders have the first option to purchase their reserved parking tickets until the cut-off date of Tuesday, 16 January 2018. 3. Parking tickets must be produced at the entrance points and on request of any traffic officer, official, steward, security officer or personnel from the FSRU and Cheetahs Company. 5. Any vehicle parked in a position which is inconsiderate to the FSRU and Cheetahs Company or to the other car park users, may immediately and, notwithstanding the display or otherwise of a valid parking permit, be removed at the cost of the owner/driver. 6. Admission to The Stadium is granted at ticket holders own risk and subject to a search on the vehicle and the passengers. 7. All passengers entering the Stadium Premises have to submit a valid entrance ticket to the official. Access will be denied to any person in the vehicle without a valid entrance ticket. 8. The bearer of a parking ticket confirms, that by entering The Stadium premises, he/she will be considered to have acquainted himself/herself with the indemnity displayed on the Important Notice erected on the outside of The Stadium and fully understands the contents thereof. 9. Parking at The Stadium is reserved and ticket holders must park accordingly to the designated area. 10. Should matches for any reason beyond the control of the FSRU and Cheetahs Company not take place no refunds will be made in respect to this ticket. 11. Tickets are not replaceable due to loss, theft, damage, or for any other reason whatsoever. 12.1 Please note that cellphone cameras will be allowed into the stadium, but unfortunately due to the nature of the business no other type of camera will be allowed in The Stadium. 12.2 Please note that due to sponsorships, raw meat may not be brought into The Stadium. 12.3 Please note that The Stadium also does not allow a vehicle to have alcoholic beverages in the vehicle when entering The Stadium. 13. Officials, stewards, security officers or personnel from the FSRU and Cheetahs Company MAY NOT keep/store forbidden items in The Stadium for safe-keeping during the duration of the event. It is the owners’ own responsibility to secure items outside of The Stadium premises. 14. Tickets cannot be refunded, cancelled, returned or exchanged. 15. Parking can be purchased additionally and is subject to availability. 16. FSRU and Cheetahs Company reserve the right to substitute the allocated parking of the holder with another if necessary, without prior notice to the ticket holder. 17. Failure to comply with the terms and conditions of FSRU and Cheetahs Company may resolve in access refusal or possible arrest. 23. Parking tickets may not be handed to another person either over or under the turnstiles without swiping the barcode. Parking tickets may not be exchanged through the fence or via any action where one person has already entered The Stadium, and the receiver of the ticket/-s is still outside The Stadium. Only the card holder may swipe his/her ticket/-s at the turnstiles, except when ticketing officials provide assistance. 24. FSRU and Cheetahs Company Terms and Conditions also refer to The Safety at Sports and Recreational Events Act, 2010 (Act No 2. of 2010) to ensure full compliance to the Act. Parking tickets are valid for all games played at The Stadium under the jurisdiction of the Free State Rugby Union (FSRU) and Cheetahs Company Pty Ltd (Cheetahs Company). The ticket is valid for the year in which the ticket is issued. 4. Any vehicle parked in a position which is inconsiderate to the FSRU and Cheetahs Company or to the other car park users, may immediately and, notwithstanding the display or otherwise of a valid parking permit, be removed at the cost of the owner/driver. 8. Parking at The Stadium is reserved and ticket holders must park accordingly to the designated area. Parking on the grass is not allowed. 13.1 Gas or normal “braaiers” – not allowed. Any person that wishes to “braai” at The Stadium is welcome to make use of the Braai Area. 13.2 Gazebo’s and Umbrella’s – not allowed. 13.3 Any type of social activity will be restricted to the grass area – situated between the hockey field and the hockey field pavilion. You are not allowed to park your vehicle in a position which is inconsiderate to other users or in a position where your vehicle is not in accordance with the traffic and parking flow of the other vehicles. 13.4 Only the normal stadium ablution/toilet facilities will be available for use, and not the Hockey Field facilities. 13.5 Liquor WILL NOT BE ALLOWED. Any person that wishes to consume alcoholic beverages can make use of any of The Stadium bar areas, situated all around The Stadium premises. 14. The FSRU and Cheetahs Company may conduct security searches to personal belongings and/or outer clothing on entry and exit of the parking area. 15. No parking tickets will be refunded, cancelled, returned or exchanged. 16. Free State Rugby Union reserves the right to substitute the allocated parking of the holder with another if necessary, without prior notice to the ticket holder. The hockey field is also used to provide Activation space to either sponsors, or for FSRU’s own use and in these cases hockey field parking will be re-located to where parking is available. 18. Please be advised that FSRU and Cheetahs Company reserve the right to withdraw parking from any original advertised package/season ticket holder to comply to The Safety at Sports and Recreational Events Act, 2010 (Act No 2. of 2010). 1. This ticket is only valid for children (any child who takes up a seat between 3 and 18 years of age). 2. In cases where the ticket has been bought without an adult ticket also purchased, the seat will be allocated behind the posts, North or South of The Stadium. 3. 2018 Season tickets are valid for all games played at The Stadium under the jurisdiction of the Free State Rugby Union (FSRU) and Cheetahs Company Pty Ltd (Cheetahs Company). This includes semi-finals and finals played at The Stadium. 4. Complimentary season tickets are NOT included for the Test match, semi-finals and finals. 5. International tests are NOT included and ticket holders will be notified on the entrance tickets. Except if otherwise indicated, in writing, by FSRU and Cheetahs Company to the owner of the ticket. 6. Valid season ticket holders have the first option to purchase their reserved seats until the cut-off date of Tuesday, 16 January 2018. 7. Season tickets must be produced at the entrance points and on request of any official, steward, security officer or personnel from the FSRU and Cheetahs Company. 8. Admission to The Stadium is granted at ticket holders own risk and subject to a search, may include a full body search. 9. The bearer of a season ticket confirms, that by entering The Stadium premises, he/she will be considered to have acquainted themselves with the indemnity displayed on the Important Notice erected on the outside of The Stadium and fully understands the contents thereof. 10. All seats at The Stadium are reserved and ticket holders must sit accordingly to the seat numbers. 11. Should matches for any reason beyond the control of the FSRU and Cheetahs Company not take place no refunds will be made in respect to this ticket. 12. Tickets are not replaceable due to lost, theft, damage, or for any other reason whatsoever. Tickets cannot be refunded, cancelled, returned or exchanged after purchase. In cases where any of the above has taken place, the season ticket holder will be liable to pay an Administration Fee of R100.00 per ticket, BUT the current barcode will be cancelled and a new barcode will be relocated to the season ticket holder. 13.1 Please note that cellphone cameras will be allowed into the stadium, but unfortunately due to the nature of the business no other type of camera will be allowed in The Stadium. 13.2 Please note that due to sponsorships, raw meat may not be brought into The Stadium. 13.3 Please note that The Stadium also does not allow a person with alcoholic beverages to enter The Stadium. 14. Officials, stewards, security officers or personnel from the FSRU and Cheetahs Company MAY NOT keep/store forbidden items in The Stadium for safe-keeping during the duration of the event. It is the owners’ own responsibility to secure items outside of The Stadium premises. 15. Smoking is prohibited on the stands and in suites. Children are not allowed to smoke. 16. No liquor may be consumed on the main stand and alcohol free areas on the Eastern Stand, with exception to private suites in these areas. Children may not consume or buy any liquor. 17. Kiddies area is at children and parents own risk. 18. Parking can be purchased additionally and is subject to availability and Proof of Valid Vehicle License. 19. Season ticket discount is not given to child/student packages. 21. FSRU and Cheetahs Company reserve the right to substitute the allocated seat or parking of the holder with another if necessary, without prior notice to the ticket holder. 22. Failure to comply with the terms and conditions of FSRU and Cheetahs Company may resolve in access refusal or possible arrest. 23. The ticket holder hereby indemnifies and holds the FSRU and Cheetahs Company harmless from and against all damages and liabilities suffered or incurred in connection with, resulting from or arising out of any breach of the T&C. 24. Admission to The Stadium and Venues is at the ticket holders’ own risk. 25. Neither FSRU nor Cheetahs Company, or any person/company acting on behalf of the FSRU and Cheetahs Company, shall be liable for any loss or damage sustained within the premises or personal injury or accident to the ticket holder. 26. Ticket resale or ticket touting is not allowed. FSRU is the only licensed ticket seller and are the only controlling body to sell Event Tickets either at the FSRU Ticket Office or through the official website. 27. Game Day tickets may not be handed to another person either over or under the turnstiles without swiping the barcode. Game Day tickets may not be exchanged through the fence or via any action where one person has already entered The Stadium, and the receiver of the ticket/-s is still outside The Stadium. Only the card holder may swipe his/her ticket/-s at the turnstiles, except when ticketing officials provide assistance. 28. FSRU and Cheetahs Company Terms and Conditions also refer to The Safety at Sports and Recreational Events Act, 2010 (Act No 2. of 2010) to ensure full compliance to the Act. 29. Season tickets can only be purchased on the lower level of the open stand or on the lower or upper level of the main stand. 30. Refer to www.fscheetahs.co.za for full terms and conditions. 31. Ticket Office: 051 407 1701 or 051 407 1725. 32. Please take note that Season Tickets, with a Test ticket included, will only be available until the Test ticket prices becomes available. Thereafter, the Season Ticket special is no longer valid and a person will then only be able to buy a Season Ticket with a separate Test ticket. 1. 2018 Season tickets are valid for all games played at The Stadium under the jurisdiction of the Free State Rugby Union (FSRU) and Cheetahs Company Pty Ltd (Cheetahs Company). This includes semi-finals and finals played at The Stadium. 2. Complimentary season tickets are NOT included for the Test match, semi-finals and finals. 3. International tests are NOT included and ticket holders will be notified on the entrance tickets. Except if otherwise indicated, in writing, by FSRU and Cheetahs Company to the owner of the ticket. 4. Valid season ticket holders have the first option to purchase their reserved seats until the cut-off date of Tuesday, 16 January 2018. 5. 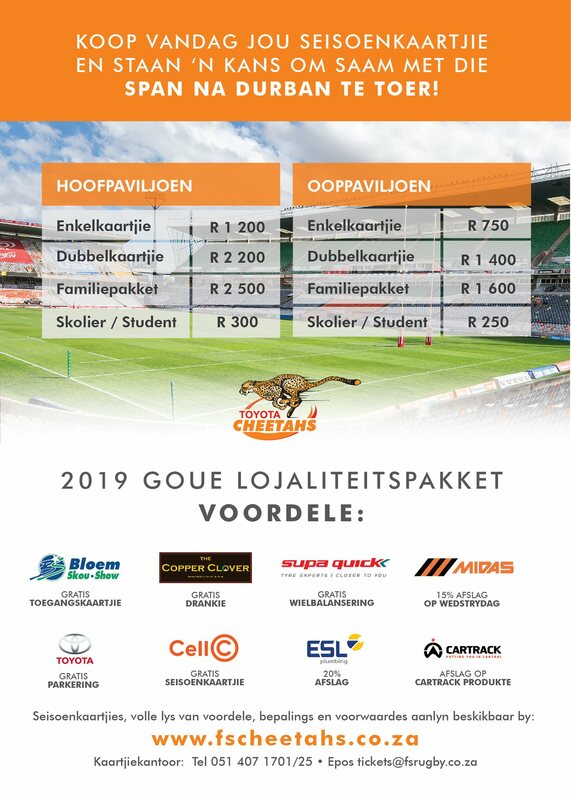 Season tickets must be produced at the entrance points and on request of any official, steward, security officer or personnel from the FSRU and Cheetahs Company. 6. Admission to The Stadium is granted at ticket holders own risk and subject to a search, may include a full body search. 7. The bearer of a season ticket confirms, that by entering The Stadium premises, he/she will be considered to have acquainted themselves with the indemnity displayed on the Important Notice erected on the outside of The Stadium and fully understands the contents thereof. 8. All seats at The Stadium are reserved and ticket holders must sit accordingly to the seat numbers. 10. Tickets are not replaceable due to lost, theft, damage, or for any other reason whatsoever. Tickets cannot be refunded, cancelled, returned or exchanged after purchase. In cases where any of the above has taken place, the season ticket holder will be liable to pay an Administration Fee of R100.00 per ticket, BUT the current barcode will be cancelled and a new barcode will be relocated to the season ticket holder. 11.3 Please note that The Stadium also does not allow a person with alcoholic beverages to enter The Stadium. 13. Smoking is prohibited on the stands and in suites. 14. No liquor may be consumed on the main stand and alcohol free areas on the Eastern Stand, with exception to the private suites in these areas. 16. Rural area discount will only be given if a member lives 100km or further with valid proof of residence. 17. Pensioners discount is only applicable to members with a valid pensioner’s card. 18. Season ticket discount can only be given to one of the above (rural areas / pension) but not both. 20. FSRU and Cheetahs Company reserve the right to substitute the allocated seat or parking of the holder with another if necessary, without prior notice to the ticket holder. 21. Failure to comply with the terms and conditions of FSRU and Cheetahs Company may resolve in access refusal or possible arrest. 22. The ticket holder hereby indemnifies and holds the FSRU and Cheetahs Company harmless from and against all damages and liabilities suffered or incurred in connection with, resulting from or arising out of any breach of the T&C. 23. Admission to The Stadium and Venues is at the ticket holders’ own risk. 24. Neither FSRU nor Cheetahs Company, or any person/company acting on behalf of the FSRU and Cheetahs Company, shall be liable for any loss or damage sustained within the premises or personal injury or accident to the ticket holder. 25. Ticket resale or ticket touting is not allowed. FSRU is the only licensed ticket seller and are the only controlling body to sell Event Tickets either at the FSRU Ticket Office or through the official website. 26. Game Day tickets may not be handed to another person either over or under the turnstiles without swiping the barcode. Game Day tickets may not be exchanged through the fence or via any action where one person has already entered The Stadium, and the receiver of the ticket/-s is still outside The Stadium. Only the card holder may swipe his/her ticket/-s at the turnstiles, except when ticketing officials provide assistance. 27. FSRU and Cheetahs Company Terms and Conditions also refer to The Safety at Sports and Recreational Events Act, 2010 (Act No 2. of 2010) to ensure full compliance to the Act. 28. Season tickets can only be purchased on the lower level of the open stand or on the lower or upper level of the main stand. 29. Refer to www.fscheetahs.co.za for full terms and conditions. 30. Ticket Office: 051 407 1701 or 051 407 1725. 31. Please take note that Season Tickets, with a Test ticket included, will only be available until the Test ticket prices becomes available. Thereafter, the Season Ticket special is no longer valid and a person will then only be able to buy a Season Ticket with a separate Test ticket. 1. A 2018 Family Package consists of two (2) adults and two (2) children with a total of 4 seats. A child is considerate to be any child who takes up a seat between 3 and 18 years of age. 2. Family Packages may NOT be bought for the entrance of four (4) adults – the package consists of 2 adults and 2 children / scholars. 3. Family Packages do apply to the Twizza Main Stand, Open Centre and Open North and South stands. 4. 2018 Season tickets are valid for all games played at The Stadium under the jurisdiction of the Free State Rugby Union (FSRU) and Cheetahs Company Pty Ltd (Cheetahs Company). This includes semi-finals and finals played at The Stadium. 5. Complimentary season tickets are NOT included for the Test match, semi-finals and finals. 6. International tests are NOT included and ticket holders will be notified on the entrance tickets. Except if otherwise indicated in writing, by FSRU and Cheetahs Company to the owner of the ticket. 7. Valid season ticket holders have the first option to purchase their reserved seats until the cut-off date of Tuesday, 16 January 2018. 8. Season tickets must be produced at the entrance points and on request of any official, steward, security officer or personnel from the FSRU and Cheetahs Company. 9. Admission to The Stadium is granted at ticket holders own risk and subject to a search, may include a full body search. 10. The bearer of a season ticket confirms, that by entering The Stadium premises, he/she will be considered to have acquainted themselves with the indemnity displayed on the Important Notice erected on the outside of The Stadium and fully understands the contents thereof. 11. All seats at The Stadium are reserved and ticket holders must sit accordingly to the seat numbers. 12. Should matches for any reason beyond the control of the FSRU and Cheetahs Company not take place no refunds will be made in respect to this ticket. 13. Tickets are not replaceable due to lost, theft, damage, or for any other reason whatsoever. Tickets cannot be refunded, cancelled, returned or exchanged after purchase. In cases where any of the above has taken place, the season ticket holder will be liable to pay an Administration Fee of R100.00 per ticket, BUT the current barcode will be cancelled and a new barcode will be relocated to the season ticket holder. 14.1 Please note that cellphone cameras will be allowed into the stadium, but unfortunately due to the nature of the business no other type of camera will be allowed in The Stadium. 14.2 Please note that due to sponsorships, raw meat may not be brought into The Stadium. 14.3 Please note that The Stadium also does not allow a person with alcoholic beverages to enter The Stadium. 15. Officials, stewards, security officers or personnel from the FSRU and Cheetahs Company MAY NOT keep/store forbidden items in The Stadium for safe-keeping during the duration of the event. It is the owners’ own responsibility to secure items outside of The Stadium premises. 16. Smoking is prohibited on the stands and in suites. 17. No liquor may be consumed on the main stand and alcohol free areas on the Eastern Stand, with exception to the private suites in these areas. 18. Parking can be purchased additionally and is subject to availability. 19. Rural area discount will only be given if a member lives 100km or further with valid proof of residence. 20. Pensioners discount is only applicable to members with a valid pensioner’s card. 21. Season ticket discount can only be given to one of the above (rural areas / pension) but not both. 23. FSRU and Cheetahs Company reserve the right to substitute the allocated seat or parking of the holder with another if necessary, without prior notice to the ticket holder. 24. Failure to comply with the terms and conditions of FSRU and Cheetahs Company may resolve in access refusal or possible arrest. 25. The ticket holder hereby indemnifies and holds the FSRU and Cheetahs Company harmless from and against all damages and liabilities suffered or incurred in connection with, resulting from or arising out of any breach of the T&C. 26. Admission to The Stadium and Venues is at the ticket holders’ own risk. 27. Neither FSRU nor Cheetahs Company, or any person/company acting on behalf of the FSRU and Cheetahs Company, shall be liable for any loss or damage sustained within the premises or personal injury or accident to the ticket holder. 28. Ticket resale or ticket touting is not allowed. FSRU is the only licensed ticket seller and are the only controlling body to sell Event Tickets either at the FSRU Ticket Office or through the official website. 29. Game Day tickets may not be handed to another person either over or under the turnstiles without swiping the barcode. Game Day tickets may not be exchanged through the fence or via any action where one person has already entered The Stadium, and the receiver of the ticket/-s is still outside The Stadium. Only the card holder may swipe his/her ticket/-s at the turnstiles, except when ticketing officials provide assistance. 30. FSRU and Cheetahs Company Terms and Conditions also refer to The Safety at Sports and Recreational Events Act, 2010 (Act No 2. of 2010) to ensure full compliance to the Act. 31. Season tickets can only be purchased on the lower level of the open stand or on the lower or upper level of the main stand. 32. Refer to www.fscheetahs.co.za for full terms and conditions. 33. Ticket Office: 051 407 1701 or 051 407 1725. 34. Please take note that Season Tickets, with a Test ticket included, will only be available until the Test ticket prices becomes available. Thereafter, the Season Ticket special is no longer valid and a person will then only be able to buy a Season Ticket with a separate Test ticket.